I’m finding it hard to get excited about finishing up some of my projects. I lost affection for my Sideways Socks when so many Sock Madness knitters had trouble with the fit, but feel I *ought* to work out the tweaks and sizes, for the sake of those non-competition knitters who’ve requested copies of the pattern. I have made progress since this photo, but my heart just hasn’t been in it. A bit better with the kilt hose. I’ve added about an inch since this image, and have about 3.5″ left to the top, with the last 2 to 3 inches being plain-ish ribbing for a “garter”. As I think about turn-down cuffs, and how to work the topmost bits of these stockings, I may decide to go with a multiple-cuffs option: i.e., finish off the top as for a knee sock, then knit a cuff(s) separately with a long bit of ribbing to tuck in under the sock-top. The plain ribbing doesn’t show, because the cuff is longer and folds over it. 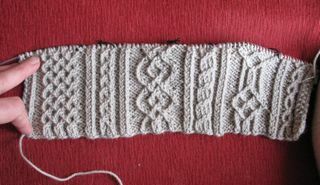 The advantage to having multiple cuffs, is that each can have a different pattern, even in the same yarn. I would have 3 layers of fabric just below the knee. Wonder how that will affect the socks’ staying-up power? 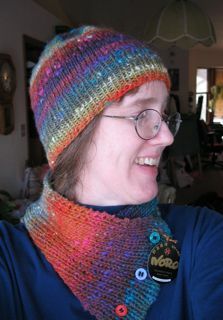 I sent in two Bavarian Twisted-Stitch proposals to Cast On this past week — one for an article on technique (Arenda H. has encouraged me on this one), and one for a cap/cowl. 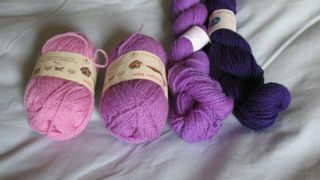 I don’t expect to hear back from the selection committee before the 10th of June or so, but I have been concentrating so much on these that my knitting “mojo” seems to be flagging now that they’re sent off! 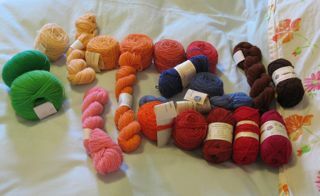 I itch to ball up some yarn and start something new! Something with silk or rayon. . . . But don’t want even *more* WIP’s, if I get bogged down, or if the proposals come through, before I finish something. 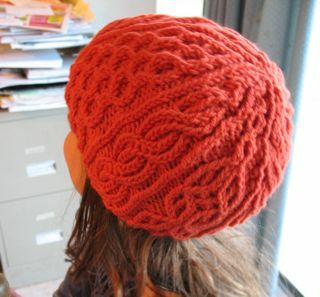 Wonder if some of the doldrums have to do with all this Product-knitting, versus Process-knitting; with finishing up an object versus enjoying the stitching. I appreciate both, but the former I perhaps associate with pressure, the latter with pleasure? . 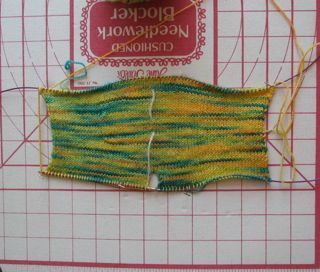 . . Maybe I should pick up my Level III swatching again — always a satisfying challenge! Could also have to do with being so emotionally drained from watching the Mel Gibson movie Braveheart for the first time this weekend — heart-wrenching stuff! I realize that there is some historical fudging going on, but Wallace’s defeat as depicted in the film is just so heart-breaking to watch! Betrayal — Such passion and pathos! Did you know: Scotland doesn’t currently have an official national anthem, but one of the most popular current contenders (“Flower of Scotland”, composed 1968) refers to these same struggles between Wallace and Bruce and Edward, which eventually led to Scottish independence from England in the Middle Ages. Cast On’s call for submissions includes a request for Bavarian Twisted Stitch patterns, so I’ve intensified my work in that arena. 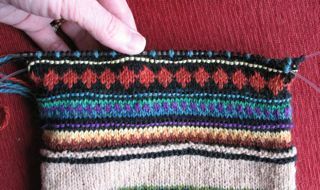 I’ve been going through my twisted-stitch book, counting stitches and rows needed for the various motifs, to see which might fit onto the back of a glove or the sides of a cap. 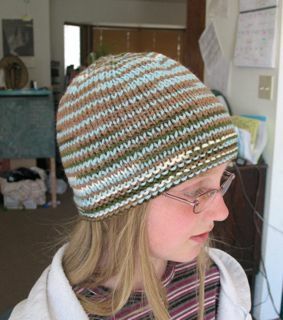 But, between my teen-genius, tech-guru DS coming home from college for the summer and my 4th grade DD returning to our home-school, however, I’ve cut back on knitting and designing time. (Pleased to do it, you understand, but a cut-back nonetheless.) 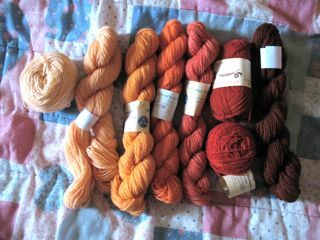 And at some point this week, I noticed that almost all my current work is in undyed/natural/cream-colored yarns — hence today’s post title. 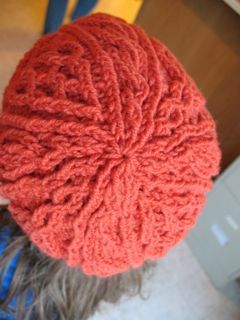 First, I’ll show you the giveaway hat I finished this week. It probably will go to Julie’s church’s annual Craft Sale — she taught me how to knit back in 1999. Yarn is a JoAnn Sensations bulky yarn, Bellezza Collection “Bellissimo”, 90% thick-thin wool with 7% nylon and 3% “other fiber”, worked on needles size US 10 (6 mm). Probably the “other” is the sparkly binder thread. Don’t know if the photos will pick that up. . . . I started at the top and increased until the “puffs” stopped lining up right on top of each other, then worked straight until the 50 grams of yarn ran out. Switched to a less-textured, worsted-weight wool and US 9’s (5.5 mm) to finish with garter stitch at the bottom. Ended up with an adult M/L size. 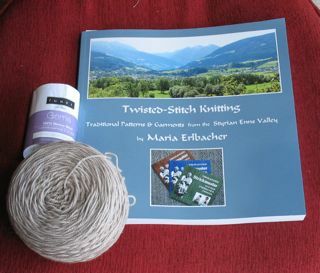 This project reaffirmed my conviction of a few years back, that I don’t really like working with thick-thin yarns. Decided I like the purl side better than the knit side, so I plan to tuck the ends in accordingly. 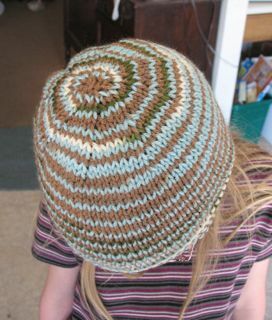 If I can do an especially neat job of that, the hat will actually be reversible! As a break from the twisted stitches, I did a little bit more work today on my sampler of Gansey stitches. 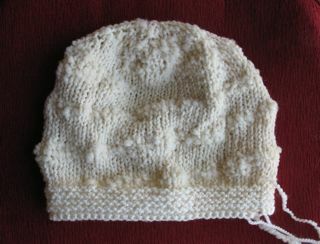 Yarn is Wendy’s “Guernsey 5-ply” on US 3 (3.25 mm) needles. 1- stockinette, 2- Mary Ann or double moss, 3-Betty Martin, 4- purl band separator, 5- bird’s eye. Next, I hope to do more moss stitch variations. 1- ladders (or steps? not sure at this point how they differ), 2- cable on seed stitch ground. Lots more vertical panels to try out! I noticed as I looked through my gansey books for cables, that nearly all are 6 stitches wide, and (at least in Gladys Thompson) cross every 7th row/round. 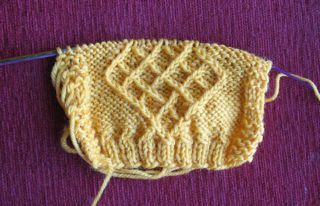 In back-and-forth knitting, this means every other crossing occurs on a wrong-side row! No problem in circular knitting, though. I also noted that almost all the cables cross to the right and are not mirrored on the other side of the chest. Probably just to make the knitting easier. I like working on this sampler. 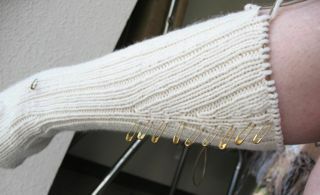 My other un-colored project on the needles just now is a pair of kilt hose in DK-weight KnitPicks “Bare” (i.e. 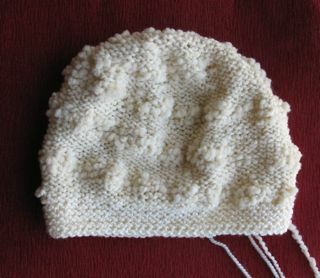 undyed) worked 2-at-a-time on one long Magic Loop circular needle. I have made the last planned pair of increases on each sock, so now the ribbing pattern is “full” again (k3-p1, with k3 at center back) and I’ve reached the widest part of my calf. If I decide the fabric is too stretched, I may go up one needle size rather than make 4 more pairs of increases. 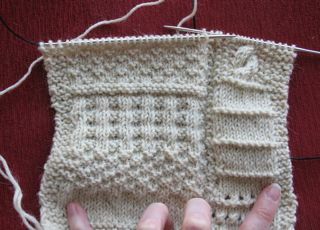 Here I’m experimenting with twisted stitches by eye, rather than following a chart or list of directions. In traditional patterns, traveling happens on every row/round, so, in order to avoid twisting on the wrong side and repeatedly trying to peek over the top, I’m making a circular swatch by carrying the yarn across the back after every row. I think I need to pick up the pace a bit on this, if I want to have a design more-or-less finalized and proposal(s) ready by the deadline. 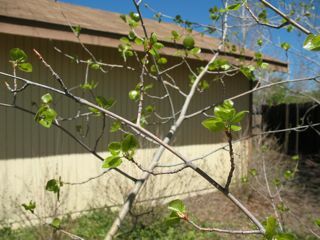 I’d like to write an article, too, about different techniques to make the twists and crosses. . . . I have long loved color-work, but lately, especially due to my involvement in Level III of TKGA’s Master Hand Knitter program, I’ve been exploring other “ethnic” knitting genres. 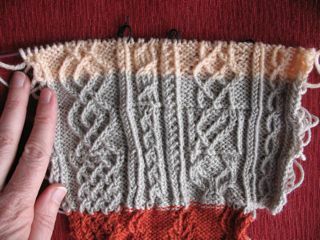 Level III requires projects, swatches and research into various knitting traditions, including techniques particular to Fair Isle, the Isle of Aran, and Bavaria/Austria. As part of my research and design planning (and for other projects I have in mind), I’ve got several samplers going. 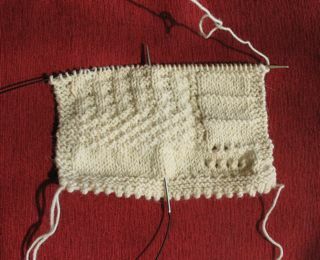 In the cream sampler, you see Channel Island cast on, holes to indicate needle size (in this case, US 4 and then 3), “steps” or “ladders” on the right, and stockinette, “Mary Anne”, and “Betty Martin” on the left. This is currently #1 option for Level III sweater project. I haven’t heard back from my kilt hose client lately, but I’m proceeding with a sampler for him (and other potential commission-ers) to consider, next time he’s in town. 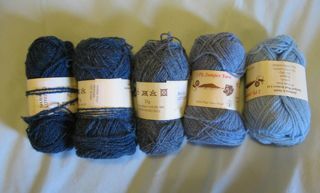 Robert asked for thicker yarn and muted colors, and Dixie wants deep blue, so here you see some worsted-weight possibilities, and the beginnings of sport-weight options (more traditional for kilt hose), plus various ribbing and cable choices. Lots of Shetland oranges to choose among, eh! I added in some periwinkle blue-purples and greens, plus some pinker reds/corals, depending on what seems called for as swatching progresses. 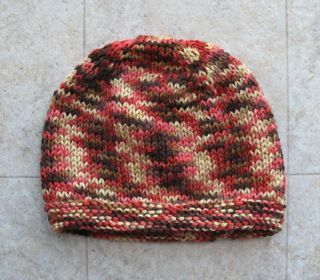 I have enjoyed working on my Bayerische cap enough that I’m really looking forward to doing more with these sorts of twisted stitch motifs (including a Level III swatch). Rightmost photo displays my new stitch dictionary and yarn for the purpose.